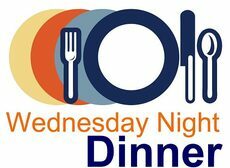 Wednesday Night Suppers have been a very successful family-oriented evening of delicious food, devotion, ministry, and entertainment. We welcome everyone to join us at 6:00 p.m. Wednesday evenings! The cost is $5.00 for adults and Free for children 12 and under. Please make a new reservation, whether it be for one night, or as a standing reservation. The forms will appear in the bulletin each Sunday. It is very important that reservations for supper be made by Monday before 3 pm. This is so the person buying the supplies, usually on Tuesday, knows how many to prepare for.